It has been a long time coming but the Argentinean coach Marcelo Bielsa is finally back and working in football, known as something of a difficult character he has been enjoying a sabbatical since leaving Marseille in 2015. In truth it was something of a surprise to see Bielsa accept his place in the new project at Lille, that is until you consider the structure at the club above him. The club is heavily indebted to previous owner Michel Seydoux, the owner who oversaw the move of the club to their new stadium Stade Pierre-Mauroy as well seeing the club win the league and cup double, Seydoux however recognised his own limitations and sold the club to Gerard Lopez, a man whom Seydoux has described as a significant investor. The sale of the club however is just one strand to the story as Lopez moved to install the former Barcelona executive Marc Ingla as the clubs General Manager. Ingla is considered to have been one of the key boardroom members during the height of the Pep Guardiola era at Barcelona. All of this created the environment which has secured the return of Bielsa to French football. The coach who is considered one of the greatest by Guardiola himself returns amid a sense of high expectations amongst Lille fans and neutrals alike. Well known for his progressive 3-3-1-3 system which he has used previously to great effect there are still question marks over the long term sustainability of his methods, Bielsa demands such complete dedication to his methods that it can cause players to become fatigued over a period of time leading to breakdown in relations between the coach and his team. It remains to be seen whether he will remain at Lille over the long term but his should be a fascinating tenure whilst it lasts. As expected the shape utilised in this match by Bielsa was a 3-3-1-3 although there were slight variances, in the defensive phase the wing backs dropped and tucked in to form a back five giving extra defensive stability. In the attacking phase we would see Benzia push forward to partner the forward forming a line of four across the width of the field. 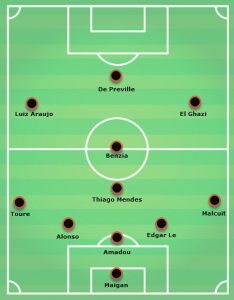 Alonso, Amadou and Edgar Le made up the back three with Toure and Malcuit as wingbacks, the role of the wingbacks differed slightly with Malcuit on the right playing behind Anwar El Ghazi, the Dutch/Moroccan winger prefers to retain the width of the field and Malcuit would choose whether to support and overlap creating wide overloads of to support from a deeper and more narrow position. Thiago Mendes was the man trusted with one of the key roles in the team as the single pivot in the midfield, he is expected to do a lot of running across the width of the field to support the ball when on either side. In the wide areas Luis Araujo and Anwar El-Ghazi offered pace and attacking intent whilst Nicolas De Preville was the lone front man. Nantes on the other hand under the Italian coach Claudio Ranieri lined up in a standard 4-4-2 shape. For those that watched Leicester City as they won the English Premier League under Ranieri the system did not come as a surprise. The visitors were compact in the defensive phase and direct when looking to transition in to the attack. That compactness however was seriously tested by the Bielsa system with extreme width from the wide attackers stretching the defensive block to near breaking point. 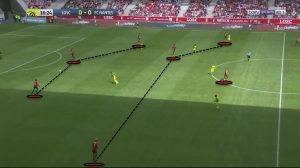 One of the keys to the attacking phase from Lille in this match was their willingness to play out from the back without a compact passing structure. Again and again we would see the Lille goalkeeper Maignan splitting out to the wide areas of his penalty area in order to give a passing option to the central defenders. 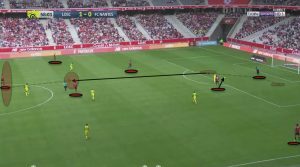 These movements from the Lille goalkeeper allowed the home side to progress the ball cleanly from the back giving them a 4v2 advantage over the two Nantes forwards. As the ball progressed forward we would then see the two wingbacks advance in to wide areas, this is where the system was in part dictated by the individual playing ID’s of the two wide forwards. Whilst El-Ghazi on the right would hold the wide position we often saw Araujo coming inside in to the left half space and allowing Toure to attack in the wide area. This pass map was originally tweeted by the excellent @11tegen11 using Opta data. You can see the basic attacking shape from Lille with the partnerships on the left and right hand side. Equally interesting is the fact that Yassine Benzia was so willing to spend a large portion on the match pushed right up in support of de Preville in attack. Here we see an example of the distribution from the back that we saw in the match from Lille. With the ball in the possession of Maignan the three Lille central defenders have spread out across the width of the field, As Nantes move to press the ball they have one player pressing the man in possession whilst the second striker looks to press the easiest passing line, with the ball on his right side the easy pass for the goalkeeper is to play out to the right sided central defender. Instead Maignan chooses to drop the ball centrally to captain Amadou, when receiving the ball in this area Amadou is then able to turn and drive in to the space ahead of him. 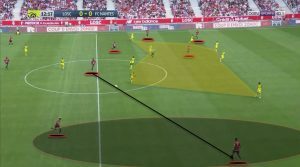 This space is dictated by the depth of the Lille structure which has forced the defensive block from Nantes deeper than they would have liked. In this example we see the trust that the Lille defenders have in their goalkeeper. With Amadou being pressured whilst on the ball centrally Maignan splits from one side of the penalty area to the other and then chooses to dribble the ball to the edge of his penalty area past the first line of pressure. As he does so Benzia drops back on to a pocket of space to allow Maignan to play the driven vertical pass in to his feet. 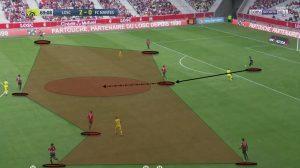 As I have already touched upon above one of the keys to the success in this match of Lille vs Nantes was the width and the depth that their tactical structure created. By using a generic 4-4-2 structure Nantes found it incredibly difficult to cover the passing angles and zones that Lille were able to exploit, of course there is an inherent risk in this from Lille in that they could be exposed by quick transitions when losing possession against a more compact opponent, this did not turn out to be the case however. Here we have the structure from Lille in the attacking phase when they are looking to initially progress the ball from the back through the thirds of the pitch. The lines that are captured in the image 3-3-1 are spread across the width of the field, with the two wide central defenders occupying the half spaces and the two wingbacks in the wide areas they are well placed to be able to easily progress the ball forwards past the Nantes midfield. This is an example of the structure from Lille in the final third. Once again they are set out with width and depth that made it extremely difficult for the Nantes defence to prevent passing lanes. In the centre Araujo has moved in to the half space and is supporting de Preville and Benzia whilst on the left hand side Toure has advanced in the wide area. On the right El-Ghazi and Malcuit are creating an overload situation in the wide area. The depth in the system is then provided by Thiago Mendes who is supporting possession centrally. Lille would go on to win the match by three goals to nil and a large reason for their relatively comfortable victory was the way that they were able to progress the ball in to dangerous areas past the Nantes defensive structure. 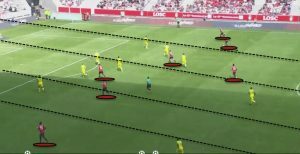 As mentioned above the width of the attacking structure from Lille was key in creating opportunities for the home side to switch possession to the underloaded side of the field where they have a one on one situation. Here Lille had initially progressed the build up down the left hand side of the pitch and the Nantes defensive structure is compact over on that side. The ball is then played back to the pivot player in the central area and switched out to the underloaded side on the right where El-Ghazi has maintained his wide position. When the wide player takes possession of the ball the Nantes left back is narrow and in a poor position to engage. Malcuit is then able to move forward from his right wing back position to support El Ghazi and create a favourable 2vs1 situation for the home side. In the end the 3-0 scoreline for the home team can be considered somewhat flattering. On the balance of play Lille were the better side and tactically they were certainly the most interesting, whilst it is still early for the players to have fully assimilated in the Bielsa system you would still expect them to far outperform Nantes in terms of expected goals. Instead as this graphic created by the excellent @11tegen11 with the use of Opta data shows there was very little difference in terms of expected goals. The first Lille goal came via Junior Alonso who shot from the angle outside of the penalty are through a crowd of bodies, the second via Nicholas de Preville was a penalty and finally Anwar El-Ghazi tapped home from an excellent low cross. As the season progresses and Lille become more adept and interpreting the Bielsa system I think that we can expect to see their average expected goals score rise. Personally I am delighted that Bielsa is back in top flight football, this season promises to be one to remember for Lille fans and neutrals alike.